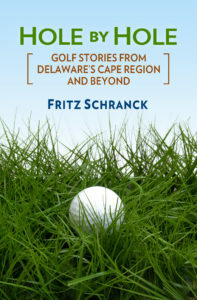 Cyclonic Golf is a new local golf company, and a welcome addition to the Sussex County economy. It began its first full-year advertising campaign the week of March 15. The Cape Region doesn’t see local companies run advertisements in national publications too often, so it’s an occasion to celebrate. The April issues of the two biggest golf periodicals, Golf Digest and Golf Magazine, just reached subscribers’ mailboxes. They should be available at newsstands by the weekend of March 20. Look for the distinctive orange logo for this upstart company. The company’s new marketing materials can also be seen at its Web site. Club professionals will see bigger, more detailed versions of the Cyclonic ads in their April copies of PGA Magazine and Golf Retailer. Munir Mashooqullah is the local head of the company. Sue McCarthy is the chief assistant at the Henlopen Junction offices on Rehoboth Avenue Extended. Mashooqullah’s partner, Cary Hensley, works out of New York. The small group of owners and employees are eager to leave their footprints in the golf shoe industry. Cyclonic makes a different kind of spikeless golf shoe. The soles are wide-track rubber molds, with 136 strategically placed cleats and treads. The bottoms jut out about a half-inch from the leather uppers. The intended stability the wider sole will provide is obvious. In addition, the right shoe’s sole design varies from the left sole. The difference is intended to support the normal golf swing of right-handed golfers, although left-handers can wear them without difficulty. Mushooqullah says when the company expands they will sell a version especially designed for left-handed golfers. Cyclonic offers two basic styles. The Heckler model is a classic wingtip, with a wider toe box for comfort. Mushooqullah says that this model is extremely popular with PGA teaching professionals and senior golfers. The feedback Cyclonic is receiving for this model is that it’s a shoe that can be easily worn all day. It comes in white and a black/white saddle style. The Highland Style is reminiscent of the desert boots that were popular many years ago. The retro styling is popular with young golfers whose sneaker choices typically run toward Vans and Skechers, and away from the larger brands. Mushooqullah says the style is a bit hit in Southern California. It’s available in suede or black leather. Each year the PGA has a huge Merchandise show for club professionals and others in the golf business. The show runs for a few days in Las Vegas in late summer and again in Orlando at the end of January. It’s easily the best location to launch a new golf product before a specialized audience of buyers and sales representatives. There is usually a waiting list for new companies because it’s such a major opportunity. At January’s Orlando Show, the event staff put Cyclonic’s display directly across the floor from one of its large competitors. Mushooqullah was pleased with the reaction to their golf shoes from the hundreds of club pros and others who stopped by their booth. Cyclonic also made itself known at other major shows earlier this year. Hensley and Mushooqullah were busy at the Sporting Goods Manufacturing Association show and at the Western Shoe Association event in February. Cyclonic’s owners are excited to be headquartered in the Cape Region. Mushooqullah is also encouraged by the response of the local business community to his new company. Stop by their office or Web site and take a look.